What Does an ICU Nurse Do? Where Do ICU Nurses Work? What Specialties Exist for ICU Nurses? Complex and challenging, Intensive Care (ICU) or critical care nursing requires an advanced technical skill set, a calm manner, and a postive life philosophy. ICU nurses provide care for life-threatening medical conditions and injuries and may work with patients from the neonatal ward to seniors. These patients have often experienced traumatic illnesses or accidents. The role is complex, as ICU nurses work to maintain and restore health to patients through careful management of their various bodily systems. Many nurses choose to specialize in working with a particular segment of the population. ICU nurses require excellent communication and leadership abilities, as well as the capacity to carry out complex directions. What's the Difference Between an ICU Nurse and Floor Nurse? A patient admitted to the floor, meaning medical-surgical, orthopedics, or other specialty, is considered to have a stable condition or disease process, which may or may not deteriorate to unstable. If the floor patient's condition deteriorates, the ICU team responds rapidly and appropriately to stabilize the patient's condition; the patient may be transferred to the ICU for closer monitoring. ICU nurses care for patients who are considered unstable. This means either they have an unstable respiratory system or cardiovascular system, or have a high likelihood of one or both of these systems becoming unstable and require closer monitoring. ICU interventions such as intubation, starting vasopressors, or pacing a patient's heart (among other interventions, which are highly situation-dependent) may be initialized quickly and efficiently due to the higher level of care in the ICU. There are some interventions that are practiced much more often by ICU nurses, and may include administering vasoactive drugs for hemodynamic instability, hypothermia protocol after a cardiac arrest, intubation for respiratory failure, CPR, performing Advanced Cardiac Life Support (ACLS), and others. Nurses with a love for data and management of a single patient's condition and outcomes generally do well as ICU nurses. An inquisitive mind and attention to processes is equally important. ICU nurses are deeply compassionate and are unafraid to advocate on behalf of their patient to family members who are distraught. What Are the Education Requirements for an ICU Nurse? With good undergraduate marks and nursing licensure, any nursing student who is interested in ICU nursing should seek a Nursing Student Externship. Usually available to senior nursing students in the final year of their program, the externship allows students to assist RNs in the ICU, benefiting greatly from the nurses' experience and mentorship. Formal externship programs are often posted online by hospitals; your college or university will often have these opportunities posted for nursing students as well. Many Nurse Externs transition into an RN New Graduate Internship program once they pass the NCLEX. For experienced RNs, making the transition into the ICU requires applying to an ICU position and usually engaging in a training program either before applying or concurrently with the application. These positions and criteria are hospital-specific but often include a didactic and mentorship portion, working under the guidance of a senior ICU nurse until success criteria and leadership in the role have been achieved. At present, RN licensure requires either an ADN or a BSN degree; many hospitals prefer to hire BSN candidates, or those who finish their degree concurrently with employment. The American Association of Critical Care Nurses (AACN) offers many certifications. For adult ICU nurses, the CCRN is a certification for acute/critical care nurses. Additional modules focused on pediatrics and neo-natals are offered too. Contact hours are required to renew the CCRN. Options are to renew by retaking the exam or by completing Synergy CERPs in the required areas, paying the fee of up to $200, and maintaining an unencumbered RN license. Due to the nature of the work that they do, and that they need specialized equipment and resources to care for their patients, it's common for hospital networks to share resources, locating an ICU unit (and its nurses) at larger hospitals, centralized hospitals, and teaching facilities in order to maximize the resources that patients might require. Hospitals without critical care facilities have transfer agreements with the nearest intensive care unit. ICU nurses work almost exclusively within their unit; not much work is done by way of policy or outreach due to the nature of the role. A critical care nurse works in the intensive care unit of a hospital with either pediatric, neonatal, or adult populations. They may specialize, depending on the needs of the patient demographic and the size of the hospital in which they work. ICU nurses work at high ratios with patients who already have, or have a high likelihood of developing, a life threatening complication, and trauma or disease process as ICU patients require intensive and frequent nursing care, assessments and monitoring." 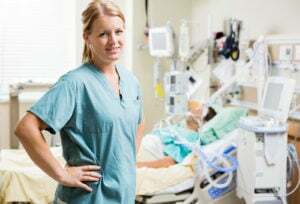 What Are the Roles & Duties of an ICU Nurse? Projected by the BLS to experience steady, higher-than-average growth over the next decade, there will be plenty of industry wide growth for nurses who want to enter the ICU. With advanced certifications and the option to specialize, nursing for critical care patients will always be in demand. The average salary of an ICU nurse is $64,764, though data tends to lean toward the upper end of the scale, topping out at $93,717. Just as with other jobs and industries, salary is affected by a nurse's location, experience, education and any certifications he or she may have or be pursuing.